It is a fact that people avoid sponsored search results and rarely make it past page two of their result listings on Google. So how do you get your business to the top and keep it there? It has been predicted that Internet sales will make up nearly half of all purchases by 2012. As a result, being at the top of organic search results can literally transform your business. 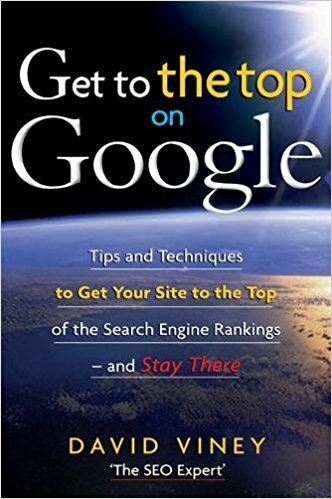 Get to the Top on Google: Tips and Techniques to Get Your Site to the Top of the Search Engine Rankings-and Stay There is the first book to comprehensively address all aspects of modern day search engine marketing through a straightforward methodology, which includes an up-to-date assessment of the impact of Web 2.0 on marketing strategies. Thorough and accessible, Get to the Top on Google provides you with the advice and knowledge of a genuine expert in the field. Through a series of case studies and examples, David Viney shows business owners, both large and small, how to improve their search engine rankings, leads, and sales in order to stay ahead of this next step in the evolution of consumer behavior.